When you step into a manufacturing facility today, you'll quickly see that it's not the same environment it may have been 50 years ago. The new era of manufacturers operate in technology-driven, innovative environments (think clean rooms, robots, and lasers—yes, we said lasers) to produce materials and products demanded around the globe. And because of this new evolution, today's manufacturing careers are much more diverse than those of generations before. The opportunities are high-tech and can range from electronics and mechanical engineering to software, IT and networking as well as industrial engineering, process engineering and project management. And we're here to show you that these cutting-edge skills and jobs are in demand right here in South Central Wisconsin. We can't (and won't) keep the secret that there are good-paying manufacturing jobs (and long-term careers) in the U.S. and that many are available right here in South Central Wisconsin. That's why we're partnering with the Dodge County Manufacturing Business Alliance and Dane County Manufacturing Business Alliance to show you how and why manufacturing works. 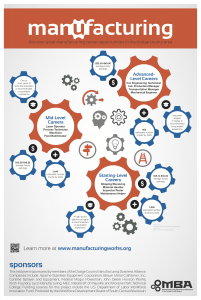 Check out the career resources, videos and the starting-, mid- and advanced-level career opportunities available locally in manufacturing. 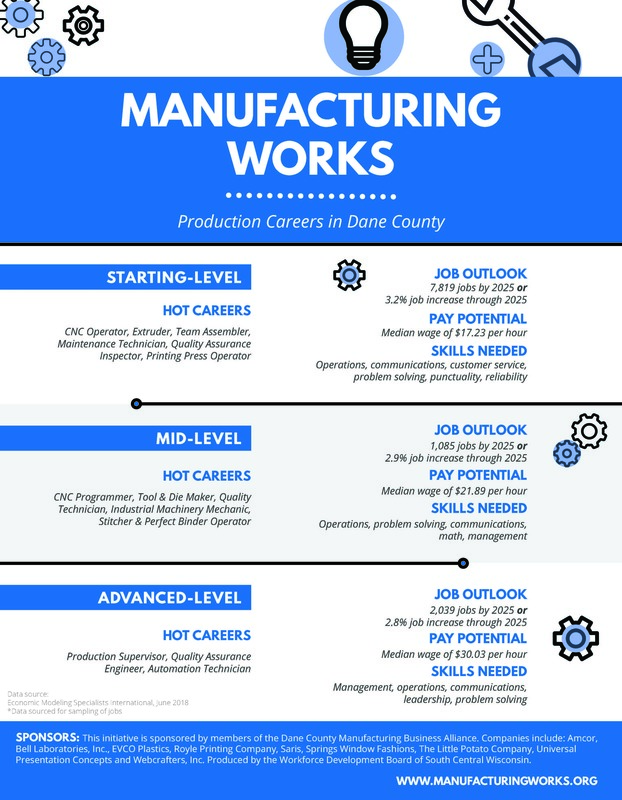 We launched the Dane County Manufacturing Works campaign in October 2018 to promote careers in manufacturing. The campaign features print materials, video and social media to show 21 Dane County high schools the rewarding, highly skilled jobs available in the region. 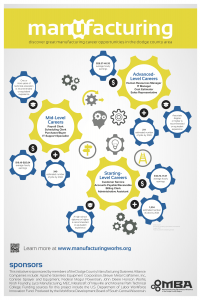 Download the Manufacturing Works posters to see what career pathways are available locally in manufacturing. Learn more about wages, skills needed, job availability in Wisconsin and more. As part of the Dane County Manufacturing Works Campaign, Royle Printing, Sub-Zero, Wolf, Cove and Saris are hosting open houses at their facilities in April 2019. Join us at the open houses to tour the facilities and meet with staff to learn about manufacturing, production and careers. 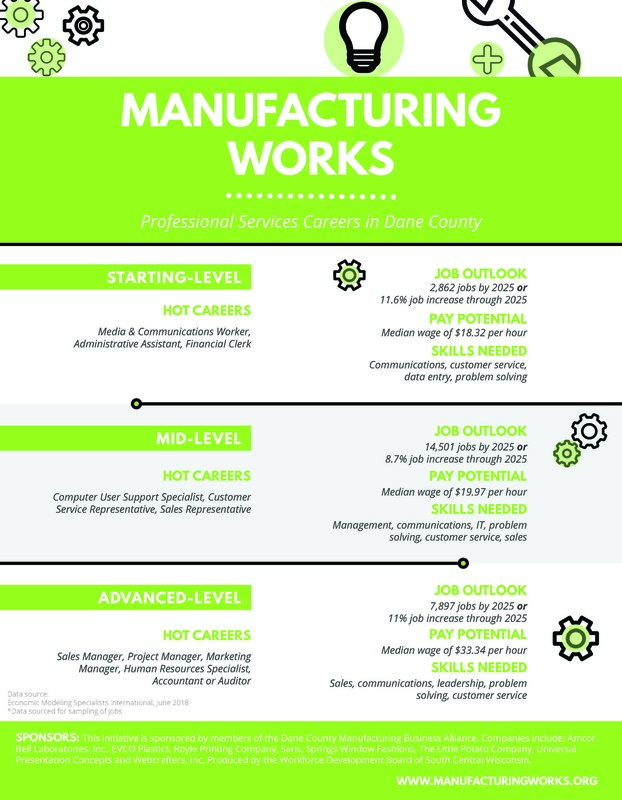 The Dodge County Manufacturing Works campaign was launched in 2015 to share the rewarding careers available in the industry. 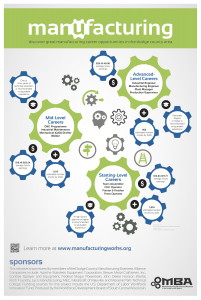 Download the interactive posters to see what career pathways are available locally in manufacturing.